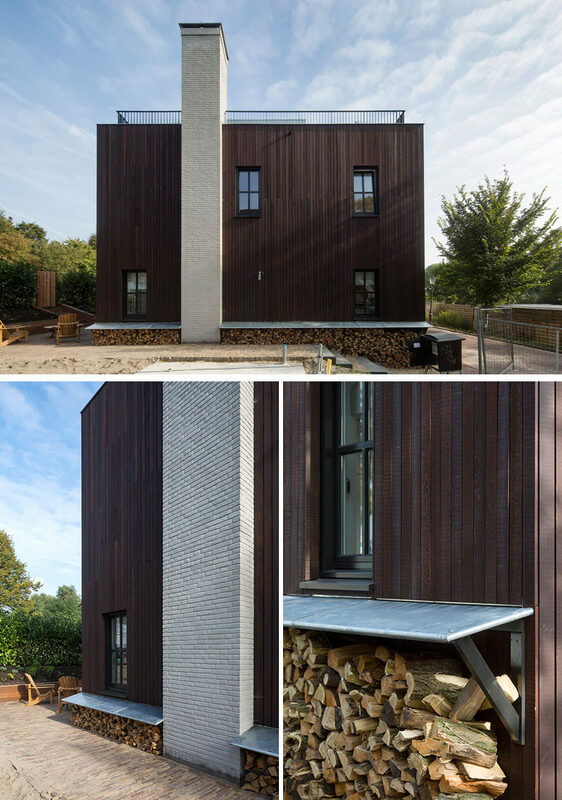 Dutch firm HOYT Architecten have designed a contemporary house in Amsterdam, that’s reminiscent of a converted barn or industrial building. 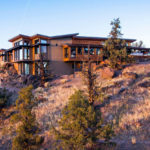 Sturdy and strong, this home met the client’s expectations of having a house where their kids could walk in with muddy feet. 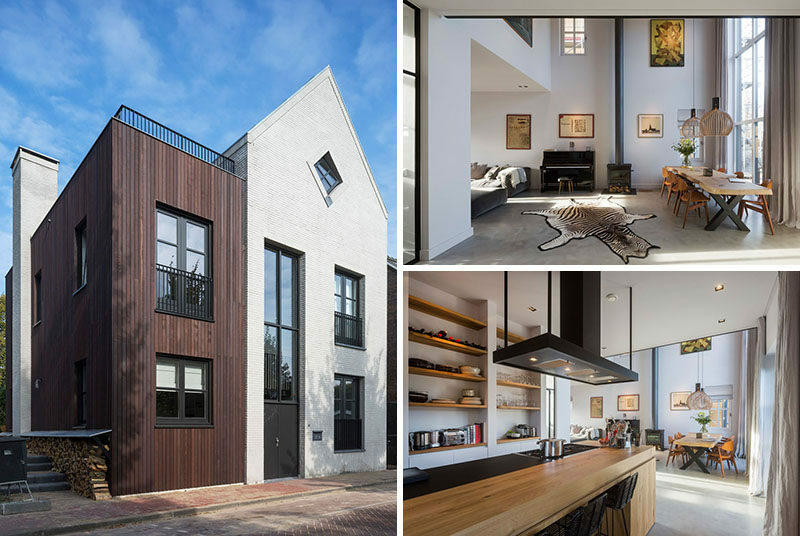 An exterior of white brick and dark wood make this home stand out on the street. 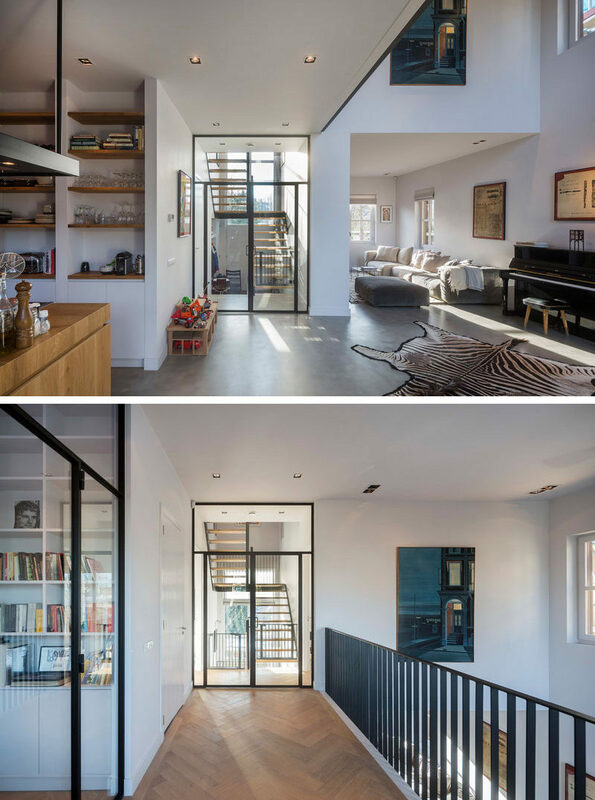 The black door, and black window frames match the roof top terrace railing. Cut-up firewood is cleverly stored along the left side of the home. White brick is used again, making the chimney stand out against the wood siding. 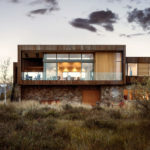 Heading inside, the dining room and living room have an open floor plan, with the dining area defined by the double height ceiling that measures in at 20ft (6m) tall. Beside the dining area, is the kitchen. A light wood island with a built-in stove and space for seating is the focal point in this room. 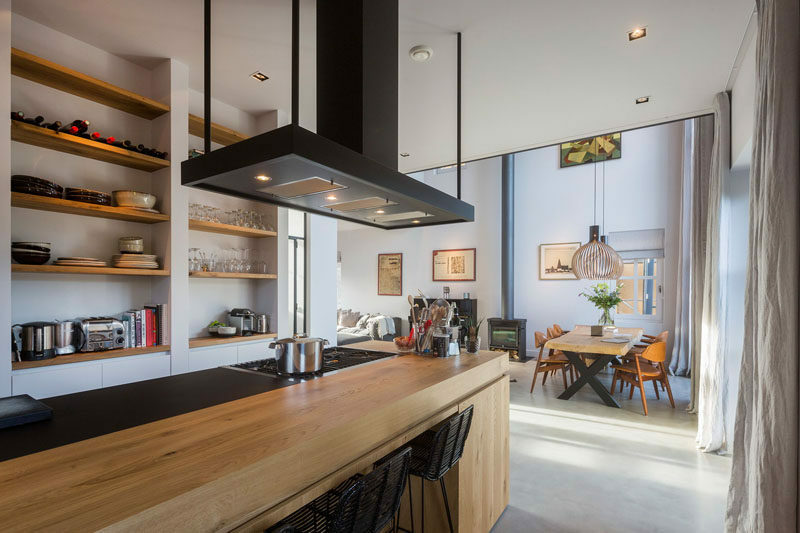 Exposed wood shelving on the wall makes housewares easy to reach. Around the corner from the kitchen are the stairs that lead to the upper floor of the home. 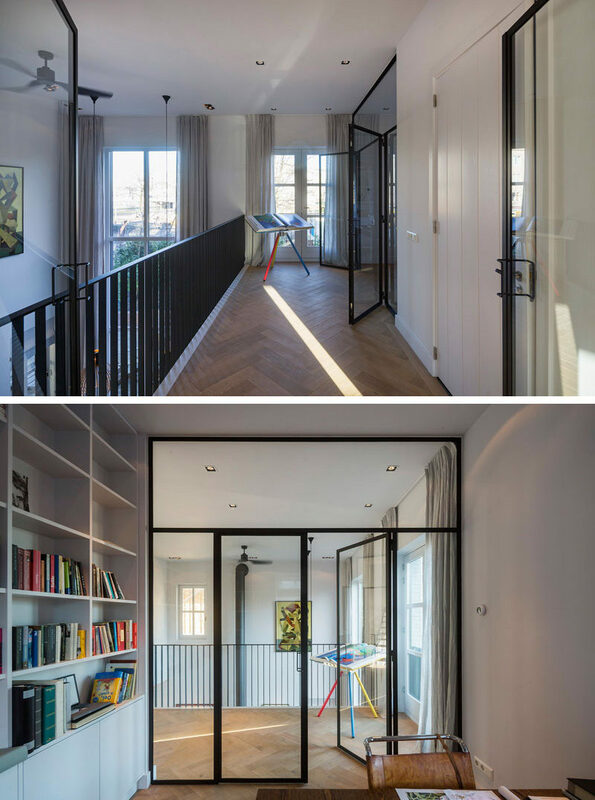 Light wood flooring laid in a herringbone pattern is used to contrast the black railing on the balcony, which matches the black frame work found throughout the home. The home office can be entered through a set of glass double doors, which allow for as much light to enter the room as possible. White built-in bookshelves and storage keep the room organized. 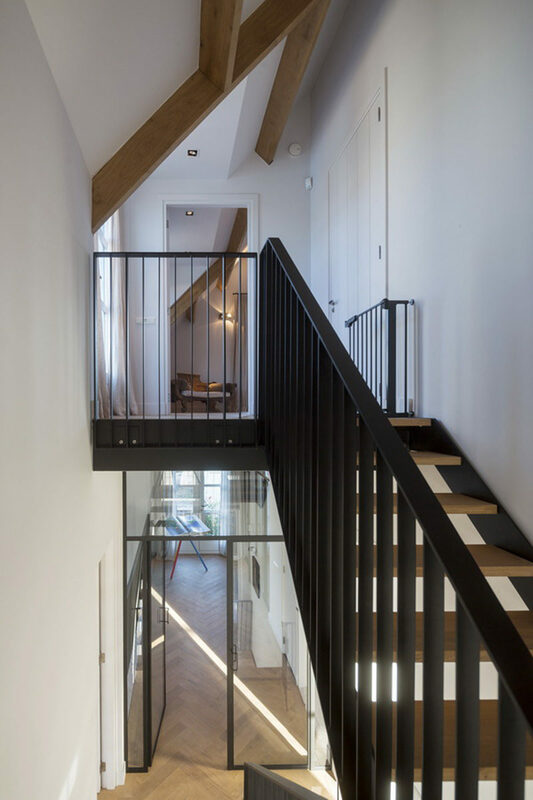 A final flight of wood and black steel stairs lead up to the top floor of the home. The master bedroom and ensuite washroom are uniquely shaped by the roof line of the house. 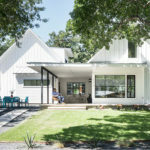 Minimally decorated with white walls and wood beams, these rooms have a contemporary farmhouse feel.